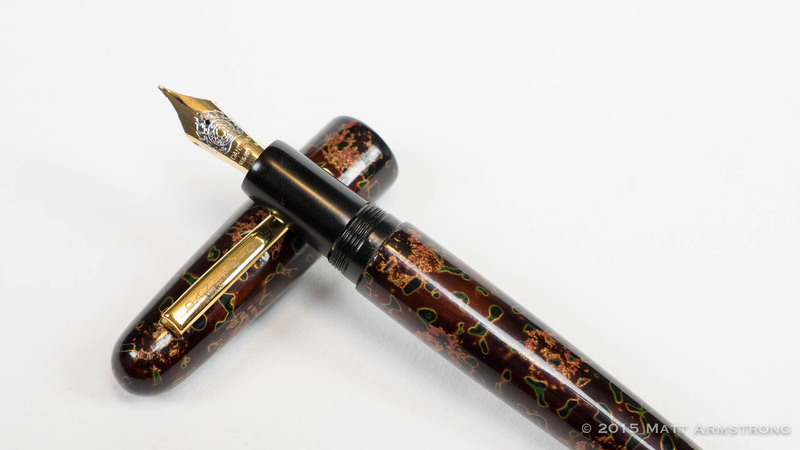 It was shortly after noon on Friday, August 12, 2015, and I found myself standing in front of the Chatterley Luxuries table at the DC Pen Show. I was dressed in hobo clothes, the airline having lost my luggage the night before. 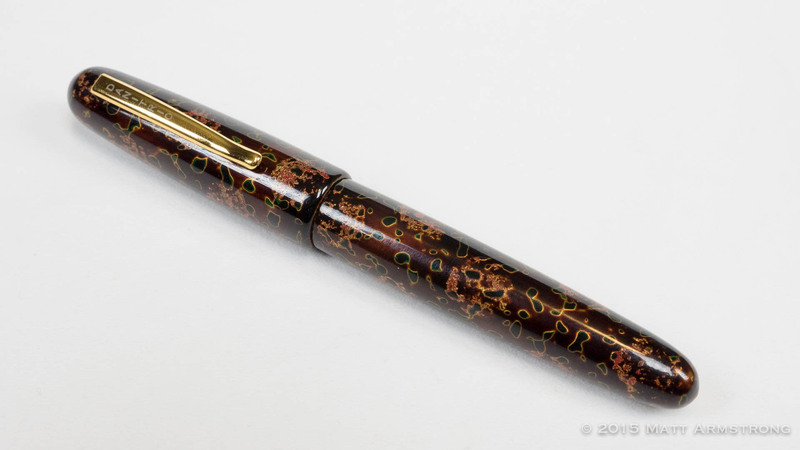 I was ravenous, as I had skipped breakfast to get on Mike Masuyama’s nib work waiting list. I was also completely overwhelmed; I had spent the last four hours winding down the rows of tables, agog at the sheer volume of pens about me. As I stood in front of Bryant’s stunning display, I found myself drawn to a tray of shiny, colorful pens, glossy with Urushi lacquer. Most were almost comically oversized, intricately designed maki-e creations that didn’t hold much interest for me as they were clearly meant to be show pieces, not daily writers. 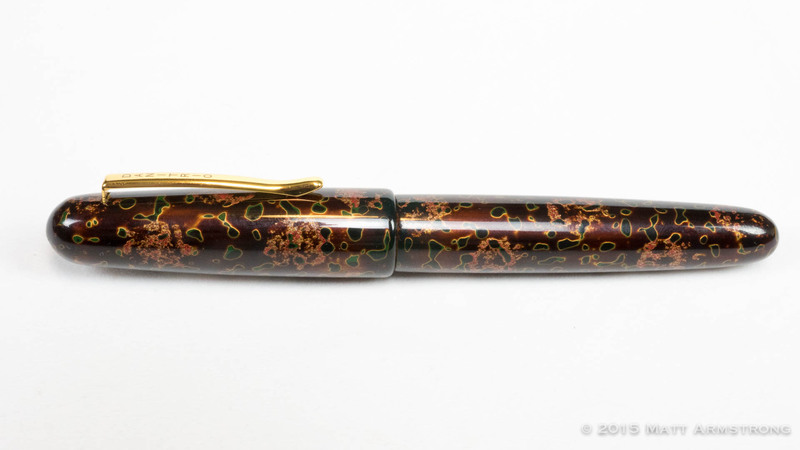 Among the collector’s pens, however, was a stunning cigar-shaped pen with a random, almost organic design in a size and shape that just begged to be used. hungry, tired, and wearing the few pieces of clothing in my size I could find at the neighboring Wal-mart the night before, I bit the bullet and purchased my first-ever Danitrio pen—the Takumi Tsugaru-nuri Kara-nuri Wine. 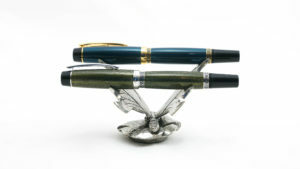 The Danitrio pen company started in the mid-1970s by Bernard Lyn, under the name of Dani. They made a mix of pens from affordable to expensive. It was never a major player in the large-scale manufacture of pens, but the line appears to have been well-respected nevertheless. Dani (and later, when they changed the name to Danitrio) has never focused on selling through regular retail channels, and over the years the company has shifted focus away from the lower end parts of their line. Instead, they have moved almost entirely into their high (and very high) end pens. My Danitrio is, as far as I can tell, one of Danitrio’s Takumi models. The Takumi appears to come in both rounded-end and flat-topped varieties. Mine, being a rounded-end variation, is a relatively common cigar shape in a large size. 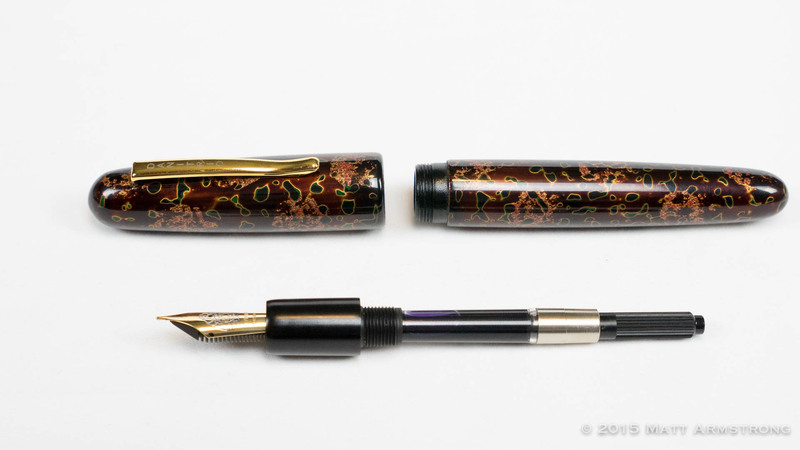 It’s close in size to a Montblanc 149, but a bit larger. 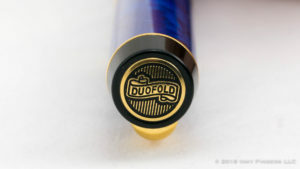 The decoration on this pen is what helps to set the variety and name of the pen. 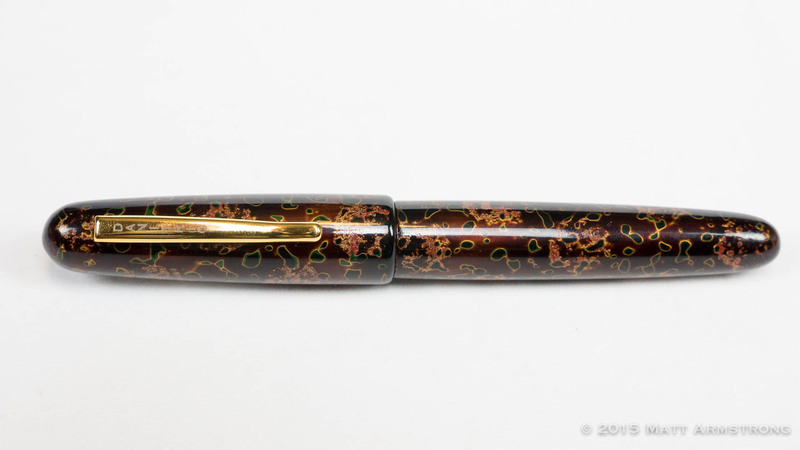 The style of Urushi decoration on the pen is known as Kara-nuri, and is part of the Tsugaru-nuri line of pens. (Tsugaru being the name of a region in the Aomori prefecture of Japan where this style of Urushi work is done.) 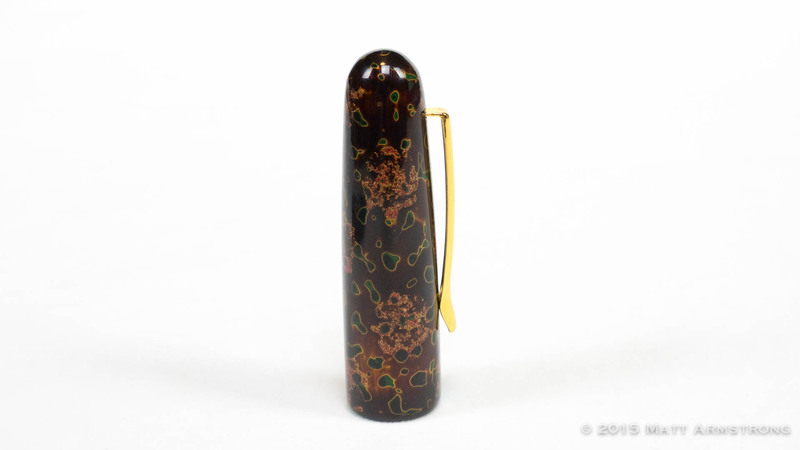 The Kara-nuri technique results in a distinctive speckled pattern created by the application of up to 48 individual coats of Urushi lacquer. The base coats are often dollops of lacquer thickened by egg whites or rice flour, and applied with special spatulas resulting in a bumpy surface. 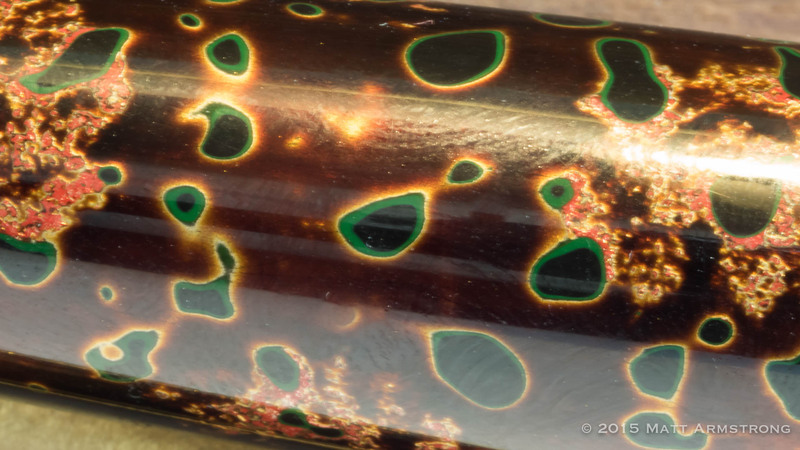 Then the urushi is built up in successive layers of different colors. 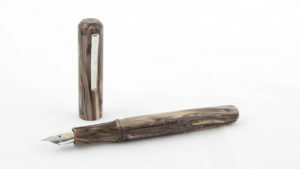 Gold powder is dusted into some layers, then the entire pen is sanded and smoothed down, and polished to a glossy shine. The result is a multi-hued, organic-looking pattern that never seems to stop moving. It is (to me at least) vaguely reminiscent of a bacterial growth in a Petri dish. 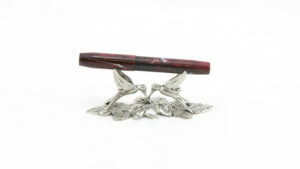 My pen is a variety of the Kara-nuri finish with a burgundy or wine-colored base tone. Putting all this together, my pen can therefore be identified as the Danitrio (brand) Takumi (model) Tsugaru-nuri (line) Kara-nuri (decoration style) wine (color). 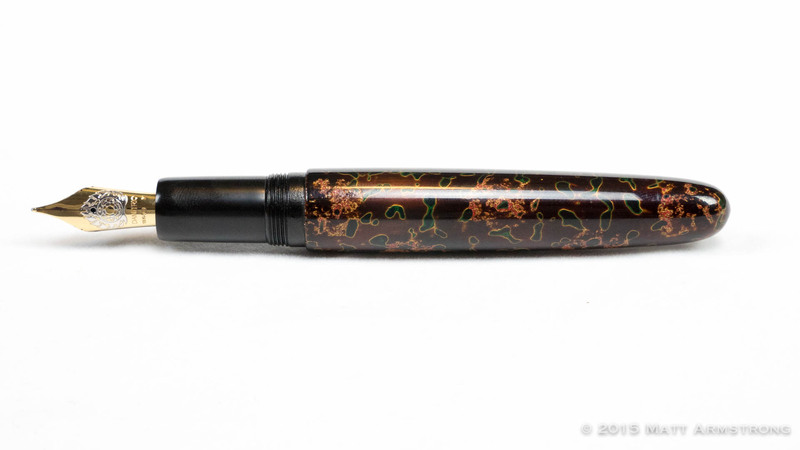 The Takumi, as with most Urushi pens, is made out of ebonite as a base material. 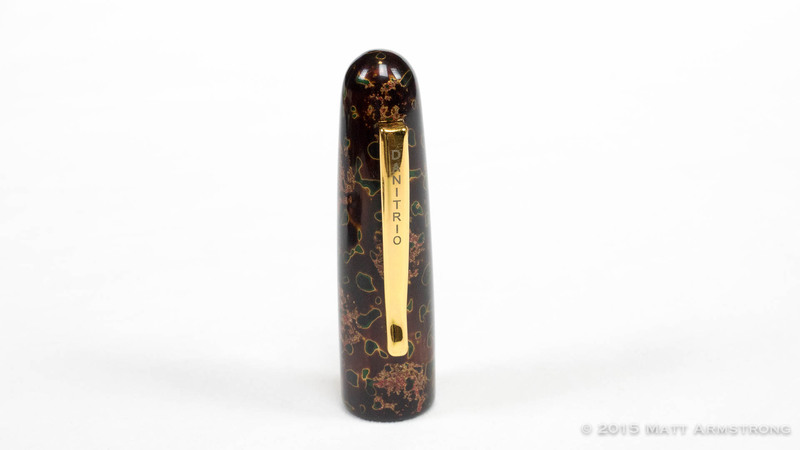 When capped, the Takumi is clothed head-to-toe in its gorgeous finish, interrupted only by a small slit cut into the cap through which the pen’s streamlined, gold-plated clip is attached. The clip is sturdy, but functional, and is laser-engraved with the name DANITRIO along its length. Underneath the cap is an ebonite section with a barely convex shape. 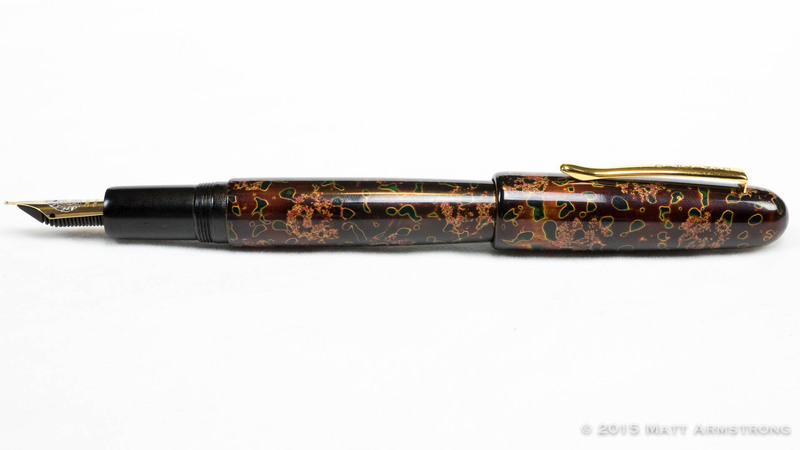 Attached to the section is a bi-color 18k gold nib that features a stunning fireball design, along with the nib gauge and karat markings. 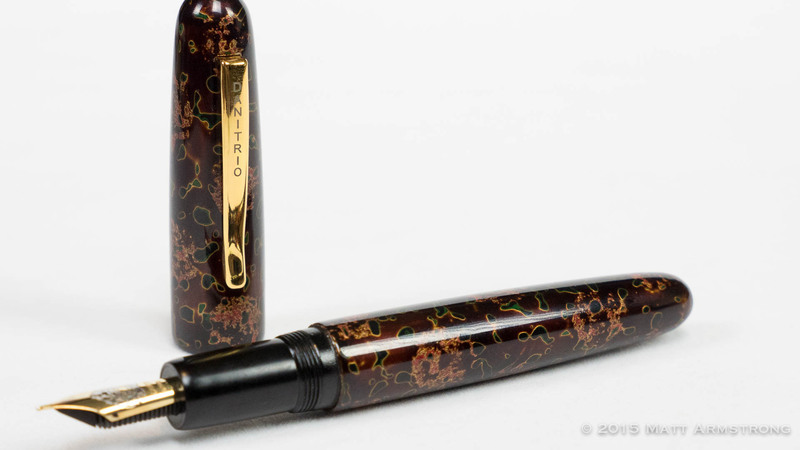 Online info seems to indicate that Danitrio nibs are manufactured by Bock. 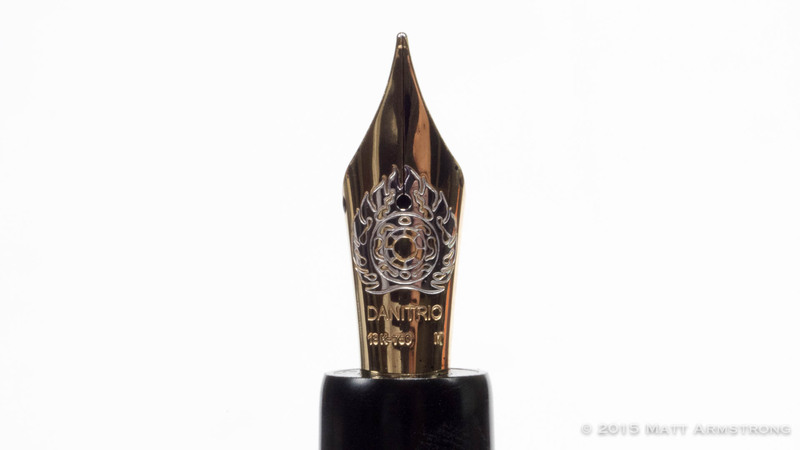 Regardless of who makes the nib, this much is true: This Danitrio 18k nib is the softest 18k gold nib I have ever used. It is not the springy kind of soft you might find from a Pilot of Platinum 14k nib. Instead, it is a lazy, almost spongy, softness which can feel sloppy if you’re not prepared for it. 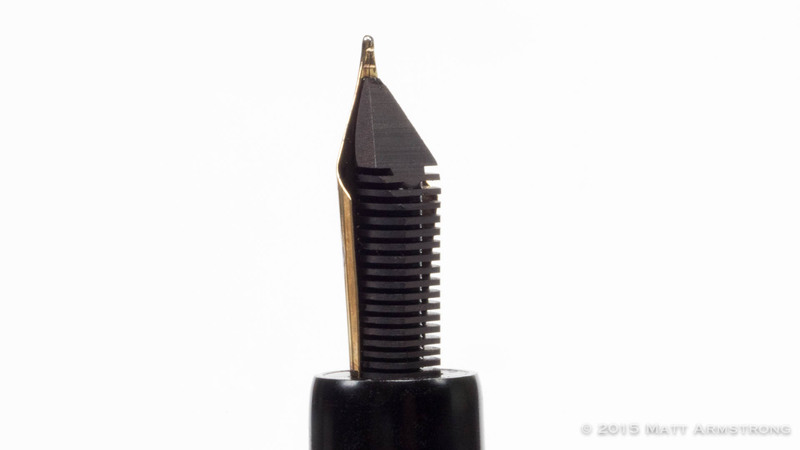 This nib will spread its tines at the barest hint of pressure, but they won’t snap back quickly at all. I happen to really love the softness of this nib, but about 50% of the people who try writing with this nib really don’t care for it. As a result of the nib’s overt softness it is almost deliriously juicy. 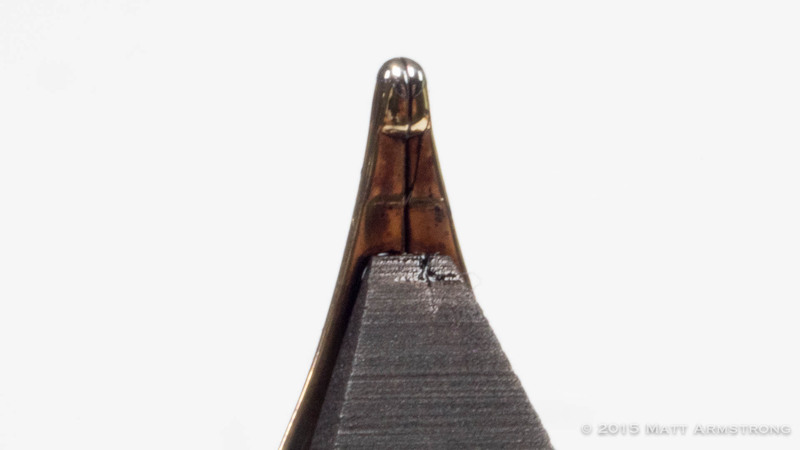 If you’re not careful, however, you can spring the nib pretty easily. (He says, his voice tinged with the bitterness that comes only from hard-won, first-hand experience.) If you understand that, and write with a light hand, this nib can really sing. It is wonderfully smooth and wet, with just enough softness to really accentuate loopy cursive handwriting and highlight shading inks. As mentioned earlier, there is no standard production line for Danitrio pens, so finding one of these beauties may be something of a crap shoot. But if you can find one, give it a go. You may end up loving it as much as I do mine. The pen for this review was purchased with my own funds.